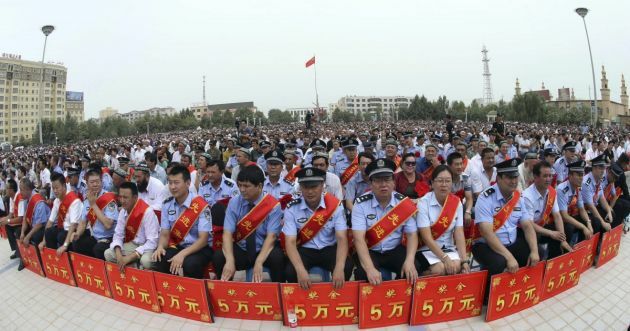 (Photo: REUTERS / Stringer)Police wearing sashes hold placards during a ceremony to award those who the authorities say participated in "the crackdown of violence and terrorists activities" in Hotan, Xinjiang Uighur Autonomous Region August 3, 2014. Masked militants attacked civilians, police and officials last week in China's far western region of Xinjiang leading to almost 100 deaths, the government said on Sunday, giving fresh details on one of the worst incidents of unrest in years. The Xinjiang government said 59 "terrorists" were gunned down by security forces in Shache county in Xinjiang's far south, while 37 civilians were killed in the attacks on July 28. The Xinjiang government said some 300,000,000 yuan (,575,130) would be awarded to security forces and civilians who recently helped in the arrest of militants. Picture taken August 3, 2014. The Chinese characters read, "Award - 50,000 yuan". Picture taken August 3, 2014. Authorities in China's Karamay City in the Xinjiang region, home to a significant number of Muslims, have declared public buses off-limits to people sporting long beards and Islamic clothing. Some human rights groups have described the measure as "racist and discriminatory." The ban was imposed during a wave of clashes and violence between government forces and local people and will be enforced until August 20 due to a major athletics event being hosted, the BBC reported on August 6. Local authorities said the order applies to "five types of commuters." These are those who wear veils, head scarves, a loose-fit coat called jilbab, and any clothing with the crescent moon and star, as well as those sporting long beards. China said the crescent moon and the star are symbols used by a group that wants to establish an independent state in north-west China called East Turkestan. "Passengers who do not cooperate, particularly the 'five types of people,' will be reported to the police," the BBC quoted a report that appeared in a local newspaper, the Karamay Daily. The report also said that authorities have warned passengers that they will be subject to bag inspections. "The security measures will ensure social stability and protect the lives, property and safety of citizens of all races," according to the report. Hundreds of people have died in violence over the past year in Xinjiang, home to the Turkic-speaking Muslim Uighur minority. Authorities blame the bloodshed on Uighur separatists. This was not the first time authorities have imposed restrictions, which rights groups say limit the religious and cultural freedoms of Muslims in the country. In July, the government enforced a ban on students and government staff from observing Holy Muslim month of Ramadan, while officials have also urged locals in Xinjiang to stop wearing Islamic veils. Also in July, Xinjiang's capital Urumqi prohibited all bus passengers from carrying items such as cigarette lighters, yogurt and water in a bid said to thwart more bloodshed in the restive region. The recent restrictions are "a typical discriminatory measure...which add to an increasing confrontation between Uighurs and Beijing," The National quoted Dilxat Raxit, a spokesperson for the exiled World Uyghur Congress, as saying.